During our two-year long usability test study on how users navigate e-commerce sites, we’ve verified that having a category navigation that uses a hover-based drop-down menu (aka a “Mega Drop-Down”) can provide major usability benefits. In fact, using a hover-based drop-down menu for the category navigation has become a web-convention among e-commerce sites. Our benchmark of Homepage & Category Navigation of 50 top US e-commerce sites reveals that in 2013 86% of e-commerce sites used a mega drop-down, and it has remained almost unchanged since (88% in 2017). In this article we’ll therefore dive deeper into our usability test findings on the “flickering issues of drop-down menus,” and provide two solutions that were verified during testing. The flickering issue: here one test subject was looking for a camera case and hovered the “Cameras Camcorders” main navigation item. When seeing the sub-categories, he spotted “Camera Cases” and moved his mouse cursor in a direct line toward it (shown by the red arrow). However, this direct line of the cursor path crossed the trigger area for the next main navigation item, “Sound Vision”, and replaced the entire drop-down menu content. The core of the flickering issue is that, once users hover a parent category in the main menu and within the drop-down menu that unfolds spot the sub-category they were looking for, they will instinctively move the mouse cursor in a direct line from the parent category to the sub-category. However, in this process the mouse cursor will often temporarily hover the trigger area of the next sibling parent category in the main navigation — causing the entire drop-down content to change. At first this issue might appear as a minor interaction detail, but this “flickering” caused great frustration to all test subjects who experienced it. The consequence is that the content of the drop-down menu will change from displaying the hit area that the user has just decided is their best path forward to displaying something completely irrelevant. and lastly, try to move their mouse cursor toward the sub-category, once more, only this time they will have to follow an invisible, non-linear “safe” hover path. A user’s natural mouse cursor path towards the hit area will be a direct line (illustrated by the green arrow). 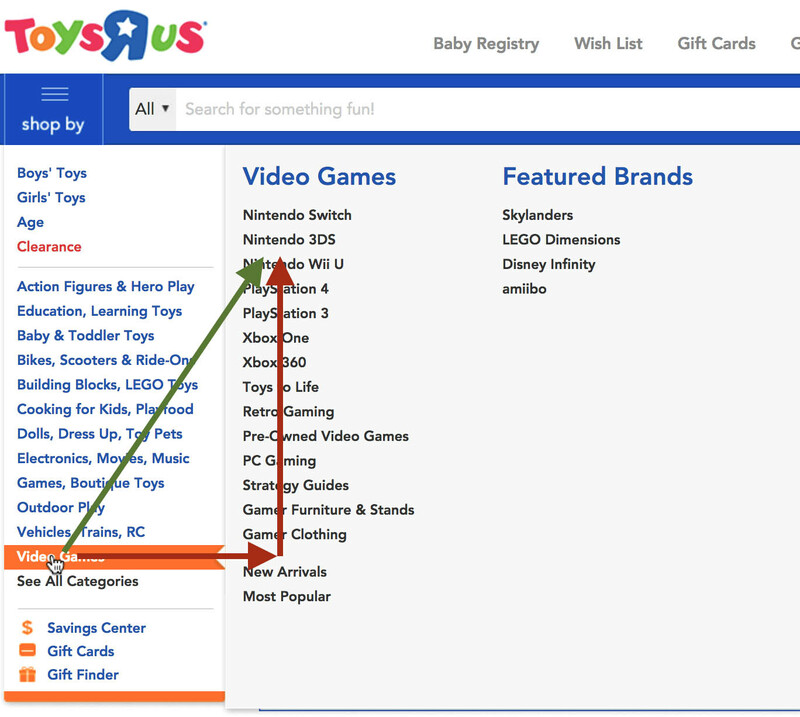 However Toys’R’Us’s drop-down implementation requires their users to instead follow the unintuitive non-linear path illustrated by the red arrows. In practice this will cause massive flickering issues. 43% of e-commerce sites have this issue. Due to how ingrained this low-level “direct-line” mouse cursor behavior is, we often observed users having the same issue multiple times in a row, before they were finally able to stop their direct-line mouse cursor movement and stop their accidental activation of the wrong parent category. What makes this “flickering” issue so severe is that it’s simply caused by users trying to interact with something as vital and heavily utilized as a site’s main navigation. When benchmarking the top 50 US e-commerce sites we find that 43% of sites make no attempt to solve the flickering issues of their drop-down menus. Luckily, we during usability testing also observed both a simple and a more advanced drop-down menu implementation that will solve the flickering issue. 1) The Simple Solution: A Hover Delay. A large part of the “flickering” issue can be solved by adding a minimum amount of time the user has to hover a new trigger area (the parent categories) before the current drop-down content is replaced. Typically a delay of around 300 milliseconds is observed to eliminate the worst “flickering” without introducing needless friction for intentional-hover interactions. On the other hand, the hover delay should be long enough to actually avoid the issues of accidental activation. 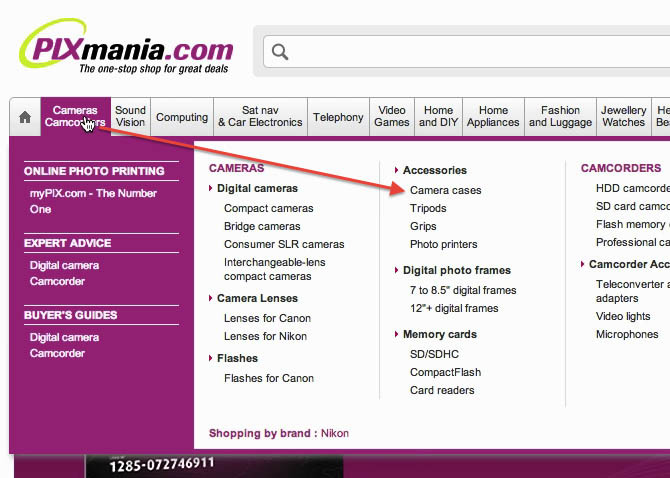 Horizontal drop-down menus with narrow navigation items (e.g., the prior-shown Pixmania example uses very narrow double-line items) and vertical drop-down menus of low height (seen in the Amazon example below) are especially prone to the issue, and will need a long delay, as the “safe” non-linear mouse path is relatively small. 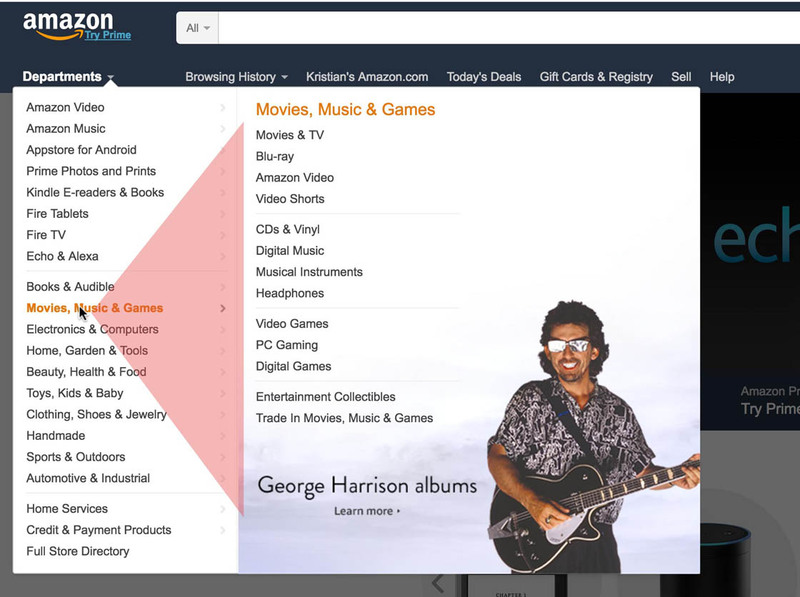 Despite having vertical menu items of very low height, Amazon solves the issue of accidentally activating sibling categories by using a mouse path analysis, that adds an extra-long hover delay if the user moves in a direct line toward any of the sub-categories of the expanded drop-down menu — we’ve here marked the mouse path that triggers the extra hover delay in red. By using a more advanced implementation that accounts for the direction of the user’s mouse path we can create the ideal hover delay. We can eliminate any accidental activation of the sibling parent categories by adding an extra-long hover delay if the mouse cursor is moving in a direct line from the cursor’s current position towards the sub-categories. (Or just between the hit area of the parent category and its sub-categories.) In the above Amazon example this is seen in the area marked in red. At the same time we can remove the hover delay entirely when users are not moving their cursor towards the sub-categories, e.g. if they are deliberately moving it towards a sibling parent category. Note how a Mouse Path Analysis ensures there’s no unnecessary delay when users are moving between parent categories, but simultaneously has a long delay when they move their cursor in a direct line towards the sub-categories — thus avoiding accidental activation of the parent categories. This more advanced Mouse Path Analysis solution will be a prerequisite for making vertical drop-down menus work decently, as the height of a vertical drop-down menu item will always be low compared to its width (causing the “safe” hover area to be very small). However, the Mouse Path Analysis solution will also greatly improve a horizontal drop-down menu. One might ask why we don’t simply get rid of the hover-based drop-down menu and instead have it be click based. The greatest usability benefit of hover-based drop-down menus is that users are able to read through the main categories, then hover one which might be appropriate, and then based on the revealed sub-categories infer if it is in fact the appropriate category or if they need to explore other main categories. Indeed, during our Homepage & Category Navigation study we found that 55% of the test subjects deduced the correct parent scope and category taxonomy solely with the help of hover-based drop-down menus — it allows them to probe into a parent category without a click commitment. Another 21% have a drop-down menu design that is very prone to accidental activation of sibling parent categories (i.e., they either use a vertical drop-down menu or use a horizontal menu with narrow multi-line menu items) without at the same time using any Mouse Path Analysis feature to more intelligently control the hover delay. For something as important as the site’s main navigation, using either a basic hover delay or the more ideal Mouse Path Analysis is required to attain a good performance for any hover-based drop-down menu where users can otherwise experience “flickering” issues by accidentally hovering sibling parent categories. Authored by Christian Holst. Published on March 14, 2017. Doesn’t work on mobile/touch anyway. Just have use click to open. Easier all around including accessibility. Hi, this is one area where mobile and desktop should rightfully differ. Mobile menus are single column and click based because of the limitations of the platform. Desktop designs should not be limited that severely simply due to the mobile platform limitations. 2) desktop have both hove and click, which is a powerful combination. E.g. on desktop in a main drop-down menu users can hover a parent category to expand the options within (as when above in this article), but they can also choose to click that parent category (typically leading to a intermediary category page (see https://baymard.com/blog/ecommerce-sub-category-pages ). This proved to be a highly important ability during our category navigation study. While “workarounds” for this exists on mobile, we did during our mobile study not see these to perform nearly as great. Flickering issues are annoying. To the point that I will not use a site with this type of problem, even if I really want to buy something. I get annoyed and exit the site! Hover also poses problems for touch devices. Designing with touch in mind from the start seems like a good idea in an age where touch devices are slowly taking more and more marketshare. Hi Nick, if you are referring to not having a hover-based menu for desktop; this is one of the areas where mobile and desktop should rightfully differ. Mobile menus are single column and click based because of the limitations of the platform. Desktop designs should not be limited that severely simply due to the mobile platform limitations. 2) desktop have both hover and click, which is a powerful combination. E.g. 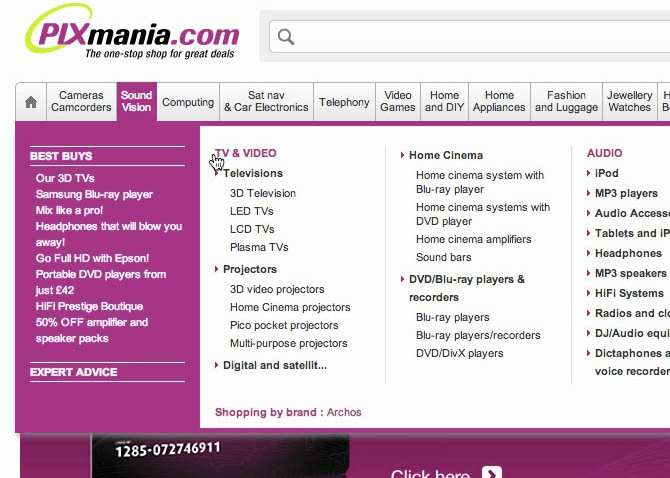 on desktop in a main drop-down menu users can hover a parent category to expand the options within (as showed above in this article), but users can also choose to click that parent category (typically leading to a intermediary category page (see https://baymard.com/blog/ecommerce-sub-category-pages ). This proved to be a highly important ability during our category navigation study. While “workarounds” for this exists on mobile, we did during our mobile study not see these to perform nearly as great. But what about touch screen desktop devices? More and more laptops support this functionality. What should the expected behavior be knowing this? Should we limit the hovering capabilities on desktop devices because of touch? Meta comment to the accessibility of this article: In the Toys R’ Us example, the red and green arrows are too hard to distinguish, if you, like me, are red-green colorblind.